At only 21 years old, Danny Kingad of Team Lakay is on the cusp of fighting for the One Championship's flyweight strap. The young prospect is scheduled to see action at the GOR Kertajaya Arena in Indonesia on July 29 in an event dubbed One Championship: Conquest of Kings. Kingad will be sharing the cage with Hexi Getu, a 32-year-old sanda practitioner from Inner Mongolia, China. Given the fact that One Championship's flyweight division is rather thin, a win over Hexi Getu will likely propel Kingad closer to a title shot. Kingad is expected to be the favorite to win on fight night. Although he has less fights compared to Hexi Getu, he has faced much tougher opponents. Kingad has a record of 5 wins and 0 losses. Three of these wins were in the One Championship. Hexi Getu, on the other hand, has 4 wins and 2 losses. This is his record as seen on the Tapology website. Sherdog, a more reputable website, lists 2 losses and 0 wins for the fighter. Sherdog didn't include Hexi Getu's victories, all of which occurred in the Dacheng Wuyi promotion. 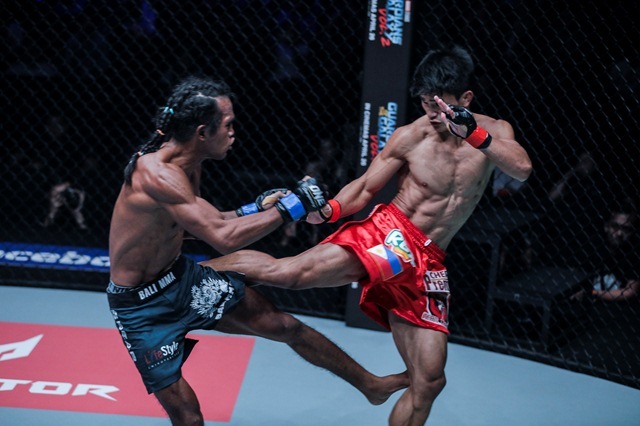 Danny Kingad (right) lands a kick on Muhammad Aiman (left) during their encounter at One Championship: Kings of Destiny last April. Image credit: One Championship. Conquest of Kings will be headlined by a rematch between Kairat Akhmetov (the reigning One Championship flyweight champion) and Adriano Moraes (the interim champion). The two fought in November of 2015. Akhmetov emerged as the winner via split decision. Due to Akhmetov's inactivity after his win, One Championship proclaimed Moraes as the interim titleholder after victories over Eugene Toquero and Tilek Batyrov. Whoever wins this match could be a future opponent for Kingad.